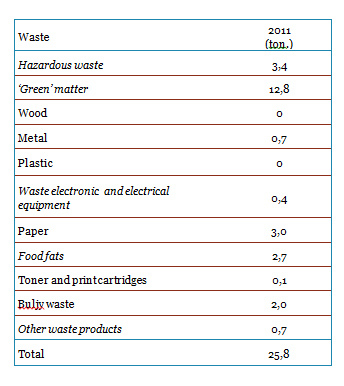 The average amount of paper purchased in 2010-2011 was 26.5 tons, i.e. 9.6% lower than in 2009 (29.3 tons), which corresponds to a per capita consumption of 3.2 tons (a decrease of 12% compared to 2009). 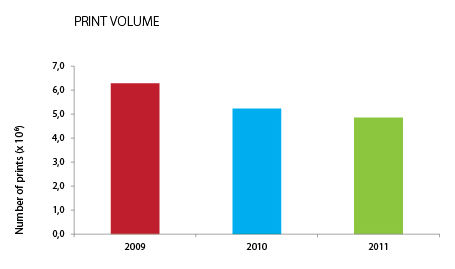 In 2011 (4.85 x 106 of printed pages) FEUP printed 1.4 million fewer copies than in 2009 (-23%). 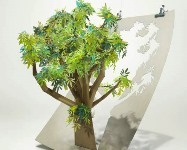 Did you know that the paper consumed at FEUP in 2010-2011 is equivalent to the felling of 312 trees? FEUP has implemented internal rules to reduce gas consumption, including a reduction in the number of hours per day and the number of months per year that the heating is turned on. 2011 saw a slight decrease in electricity consumption (6,85 x 106 kWh) compared with the previous year (2%), with 803 kWh per member of the academic community being metered. It is worth stressing that, compared with 2010, electricity consumption per member of the academic community decreased by 4%. Consumption of natural gas has declined over the past 4 years, consumption in 2011 being 107,831 m3, corresponding to 13 m3 per capita. 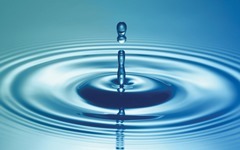 In 2011 water consumption increased (27%) compared with 2010, recording a figure of about 48,000 m3, equivalent to 5.6 m3 per member of the FEUP community. The increase may be due to water consumption in new laboratories. No withstanding this increase in water consumption, it is worth noting that in 2011, there were a considerable number of taps which were replaced by "saver" models, which ensure the same efficiency by means of a nozzle with more jets and greater dispersion, consuming only 30% of water compared to the older taps. 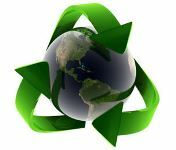 FEUP has several waste disposal tips placed at various locations. 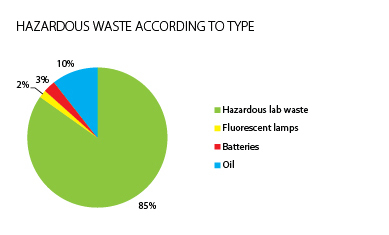 FEUP promotes best practices for treatment of laboratory waste, drawing the attention of potentially interested third parties to its practice of half-yearly waste collection. In 2011 two awareness-raising campaigns were held for the academic community - in study rooms (computer and other rooms) and toilets. 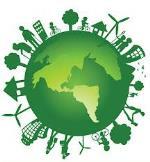 Both campaigns aimed at raising awareness of correct use of premises and equipment and the need to keep places clean. 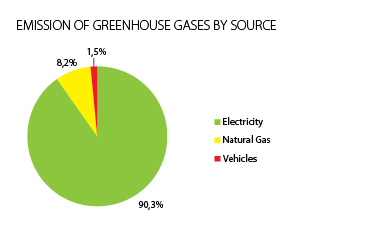 In 2011 greenhouse gas emissions stemming from the use of natural gas, electricity and vehicle circulation within FEUP amounted to 2,849 tons of CO2 (equivalent). FEUP also seeks to assist public or private nonprofit-making institutions, through the donation of equipment that they lack and which are regarded as surplus to requirements. In 2011, 116 items of computer equipment were donated. FEUP collaborates in various projects of social solidarity, particularly in awareness- raising and fundraising, such as Amnesty International, the Solidarity Card, the Association of University Volunteers, the Protection and Caring Association, among others. Culture also features in this institution with the organization by the FEUP Cultural Commission of music and dance spectacles, exhibitions, drama, workshops and art courses. In 2011, approximately 7,200 people attended events, of whom a significant proportion were external to FEUP.